YOU can help STOP the invasion - Project W.O.W. (The War On Weeds)! Invasive species are a major threat to our environment, recreation and economy in Wisconsin’s scenic Northwoods and lakes regions. Non-native plants can cause millions in damage and impact our recreation opportunities including hunting and fishing, and even damage vital ecosystem functions on which we depend! The Wisconsin Headwaters Invasives Partnership (WHIP) is a diverse cooperative with a mission to eradicate infestations of invasivesearly before they spread out of control. This approach, called early detection and rapid response (or EDRR), provides the greatest hope in the war on weeds. But, we need YOUR help as our “eyes on the ground” to find and report high priority invasives. Together we can whip invasives and protect our local resources. Join us in Project W.O.W. and contribute to an exciting project along with a growing army of concerned citizen scientists by following the 3 simple steps below. Learn how to identify the EDRR species below and look for them in areas around your neighborhood, local parks and roadsides. 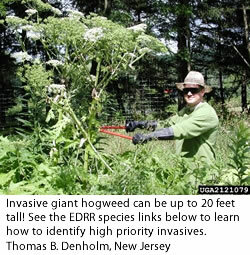 Take several pictures and use the app or the Great Lakes Early Detection Network webpage to report invasive plants that you find, especially those on the EDRR list below. There are lots of other ways to contribute to the local war on weeds. Tell others about what you have learned and recruit them. Connect with WHIP on Facebook and volunteer to help with local invasive plant control or education efforts. Many invasive plants are commonly used in landscaping, check your yard and replace invasive ornamentals with native or non-invasive alternatives. More info about invasive ornamentals can be found at MIPN.org. EDRR Species List. Click on the links below for detailed information about identifying these species. If you see them in Wisconsin’s Northwoods, sign up and report them!